The VISM Rifle Scabbard is designed to carry an M4/M16 style rifle with barrels between 10.3" and 20". The scabbard allows you to carry the gun with a magazine inserted or removed, and the MOLLE webbing allows for modular setups. These straps also allow the scabbard to be attached to packs or vests. 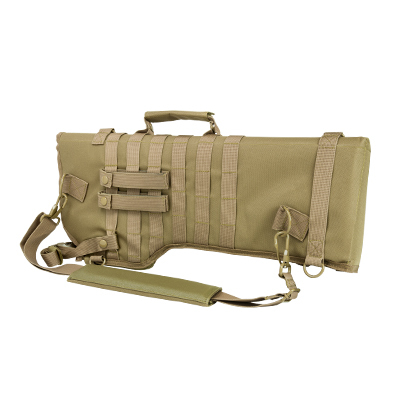 The scabbard includes a strap as well, allowing you to carry the weapon on your shoulder like a traditional duffel bag. While this particular piece is designed to fit M4/M16 styles, it should fit other rifles as well.